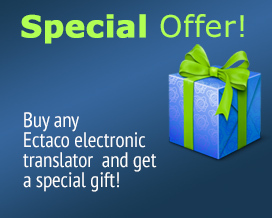 This remarkable English dictionary from ECTACO is a truly useful reference and studying aid. It features the 70,000-word WordNet dictionary with phrase read-back capabilities, user friendly look-up options, and detailed explanations for each term. Multiple reverse explanations make navigating the dictionary more convenient. Ideal reference tool you can share! Includes 130,000 words, 300,000 definitions, 500,000 thesaurus entries, a Grammar Guide, and so much more. Use the large screen and display to share a definition or a game with a friend. Type in words effortlessly using the large format keyboard. Use the headphones to listen to definitions privately. Find not only definitions of words, but words in definitions.